An easy way to create a complete cable display system. 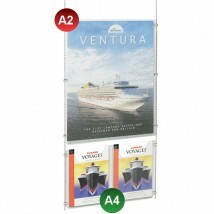 Our combination cable display kits include poster pockets and leaflet dispensers in a variety of sizes to suit any need. 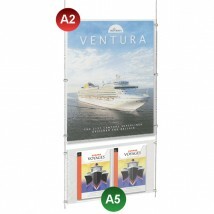 Perfect for both retail environments and exhibitions & trade shows. 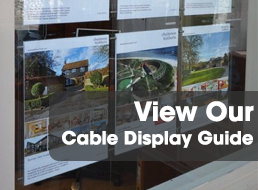 Promote your business branding and provide takeaway information or sales material in one complete cable display. We have a variety of fixing points available; wall to wall, floor to wall and floor to ceiling to ensure no matter the layout of your shop, office or trade show stand, there will always be an option. The panels are attached to 1.5mm thick steel cables via sturdy panel clamps. All kits are supplied with a fixing kit and Allen key to keep the cables taut at all times. Our cable display kits poster holders and poster pockets are available in floor to ceiling, wall to floor and wall to wall. You may also be interested in our freestanding cable displays, leaflet dispenser kits, cables and clamps and poster holder kits.